I am finally back stateside, after a delightful visit in Italy with my new granddaughter and her family! I had a wonderful time and it was so hard to leave. Sigh! Now that I am back, it seems like summer is coming to an end, school is starting, and all the year round activities are starting back up. (This summer went by a little too fast!) 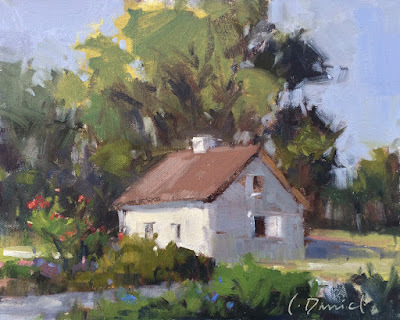 For me, it has been more than satisfying to get my brushes wet again and to be outside painting. This simple tree gesture was all I needed to get my creative juices flowing! Fall workshops at The Contemporary Austin Art School are coming up! Please join me! Glad you're safely back. I'm sure it was hard to leave. I remember flying out of Utah leaving my first grandchild as I went back to Kentucky. I used a lot of tissue. Glad to see you painting again and isn't it amazing how that one painting renews those creative juices. Good luck on the workshops. Your "simple tree gesture" is a masterpiece and would not be simple at all to another artist. You are so amazing. So happy for you about the new granddaughter. Your family is so lucky to have you! Wishing everyone in your wonderful family a super end of summer, and it sounds like you already have a busy fall planned. 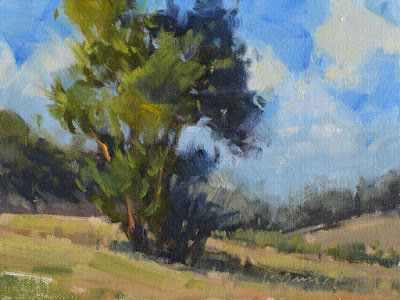 Plein Air Show and Fall Workshops in Austin!